With the vast industrial experience, we are engaged in providing Welding Services. 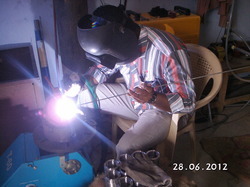 These Welding Services are highly reliable due to which these are extensively demanded by clients. We feel proud to introduce ourselves as the well-known service providers of Stellite Welding Service. The offered stellite welding service is commonly used for joining the cobalt-chromium alloy, pipes. Our offered stellite welding service is highly liked, due to zero operator error and quick welding operation. Looking for Welding Services ?